Flamboyant might be an understatement in describing a jacaranda tree in full bloom. Explosions of brightly colored purple flowers cover the tree's canopy making it eye-candy for all to behold. Native to Brazil, the flowering specimen (Jacaranda mimosifolia) is a fast-growing deciduous tree reaching a mature height and width of approximately 40 feet. Its delicate fernlike foliage can appear before or after the tree begins flowering in springtime. The bark is grayish-brown in color and the canopy is vase-shaped and open. When in bloom, it offers a riot of color within the landscape. Clusters of tubular flowers fill the canopy starting in April throughout August and last for approximately two months. Many times the flowers fill the tree's canopy before the foliage springs to life. The most common one sold, grown, and seen in landscapes (Jacaranda mimosifolia) produces bright purple flowers. However, the cultivar 'Alba' produces whitish flowers, but isn't as striking or as popular, though the period of blooming is a bit longer than the purple variety. After flowering, the tree produces 3-inch round seedpods. The pods take approximately a month or two to ripen and then fall from the tree creating another litter problem. Gardeners looking to add one of these tropical trees to their landscape should easily locate one at online or local nurseries throughout areas where they are hardy. Since the tree grows so quickly, most trees for sale average around the 1-year-old category. When purchasing a tree, look for one that is healthy and without signs of disease or damage and has one main trunk. Trees with multiple trunks aren't as strong and are more prone to splitting. The tree's container should be large enough to hold the tree without signs of the roots growing out of the bottom drain holes. When held in containers that are too small, the roots have a tendency to wrap in circles and when planted, the tree may never grow properly. Average size containers range in the 3 to 5 gallon size for healthy growth. 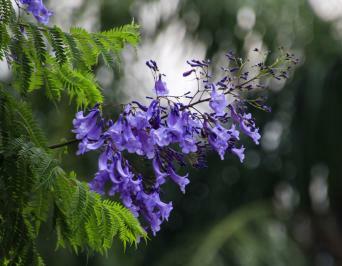 Due to their soft wood and the messy litter they create when dropping their foliage and flowers, plant a jacaranda away from structures or pools. They make attractive specimen trees and their dropped flowers leave a carpet of purple beneath the tree. They also work well used along a sidewalk, as shade trees, or planted among evergreen trees as they continue to add color to the area when they drop their leaves in late autumn and winter. Jacaranda isn't a fussy tree when it comes to its preferred conditions for growth. Gardeners living in USDA zones 9 through 11 should have few problems growing this carefree tree. For the best growth and flowering, plant it in a location that receives full sun. It will grow in locations with lower levels of light, but at the expense of the potential amount of flowers. The tropical flowering trees grow well in various soils that drain well and do not perform well in soils that are prone to sogginess. There is no need to amend the soil with organic matter because the tree produces vigorous growth even in the poorest soils. Since jacarandas grow best in subtropical and tropical climates, they do not tolerate long periods of frost or freezing conditions. Temperatures of 27 degrees Fahrenheit can damage or kill trees, especially if the cold temperatures are prolonged, and the tree is young. Due to the tree's quick growth and size, it's hard to offer winter protection for mature trees. When dealing with smaller trees, gardeners can hang holiday lights throughout the canopy to create a warm environment. Regardless of size, saturating the planting site with water to moisten the tree's root system in the event of an unexpected frost or freeze helps it retain warmth. In Western desert areas of the United States where temperatures are high, plant the specimen on the eastern, southern, or northern side of the house to prevent the trunk from getting sunscald. In these locations, the sun's rays are intense and planting on the western side of the house opens the trunk up to burning. 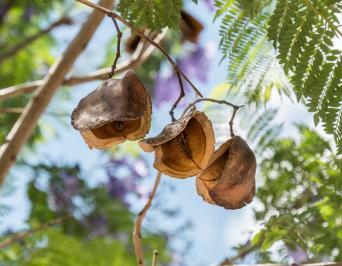 Gardeners can propagate jacaranda trees through softwood cuttings or through planting seeds. However, note that seed-grown trees take a long time to produce flowers and it can take as long as 20 years before flowering occurs. Trees propagated through softwood cuttings can bloom in in a couple of years after planting, depending on the size of the cutting at the time of propagation. Propagating the tree through planting seeds is basic. Select fully ripe seed pods from the tree, which turn completely brown and easily open, revealing the round seeds contained inside the pod. To prevent having to transplant the seedling quickly into a larger container and allow it enough space to grow into a small sapling, use a 1 gallon container with bottom drain holes. Fill the container with a potting mix that drains well. Plant the seed about 1 inch deep into the center of the container and cover with soil. Water the container after planting and keep the soil moist through continued water applications. The seed should sprout in approximately four weeks. To achieve a blooming tree quicker, propagate using softwood cuttings taken while the tree is in its dormant state. Trim a branch from the mother tree that is anywhere from 2 to 4 feet long. Slant the cut on the end of the branch that you will plant in the soil. 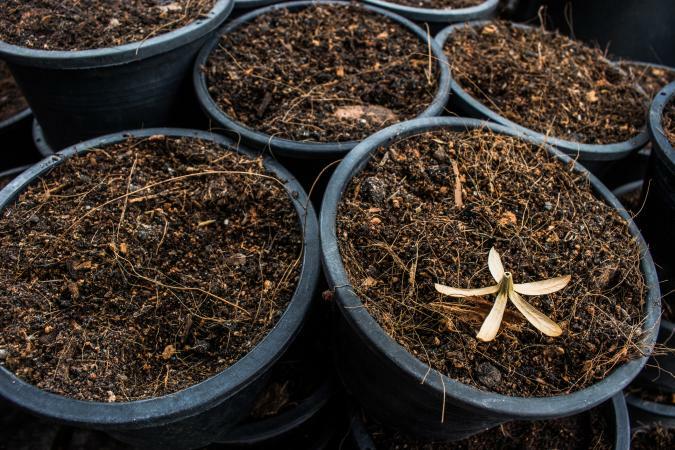 To keep from having to transplant into a larger container too quickly, thus allowing the roots to develop without being disturbed, use a 3-gallon container to grow the sapling. Fill the container with a well-drained potting mix and water to help the soil settle inside the container. Use a stick and make a hole in the container that is about 4 inches deep. Place the slanted end of the softwood cutting inside the hole and firm the soil around the cutting. Add more soil to the container if needed and firm around the cutting again. Water the container after planting and keep the soil moist through regular water applications. The root system should establish itself in approximately eight to 12 weeks. Once you've selected an appropriate site in the landscape with preferred light and soil conditions, it's time to plant the tree. Plant it directly in the native soil without adding any amendments. Remove all grass and weeds from a planting site that is approximately 3 feet in diameter. The unwanted growth robs the tree's roots of moisture and opens the tree up to damage from lawn equipment, which can damage the trunk opening it up to disease problems. Dig a hole that is two to three times deeper and wider than the root ball. This loosens the area so the roots have an easier time spreading throughout the planting site. Backfill soil into the hole so you plant the tree no deeper than it was growing inside its container. Planting the jacaranda too deep puts undue stress upon the tree. 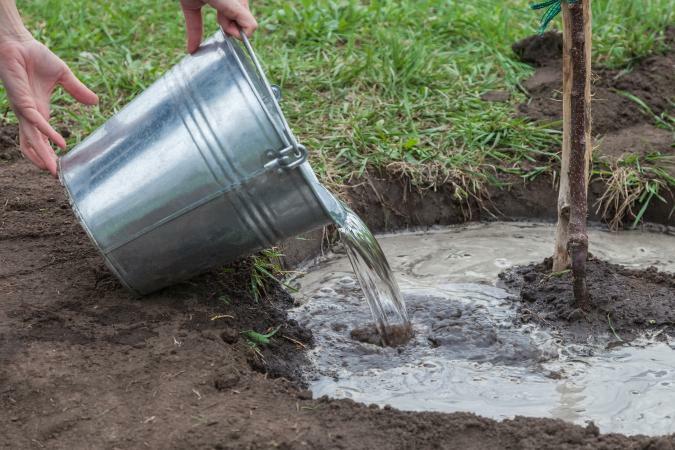 Fill the hole halfway with soil and tamp it down with your foot and water the area to release unwanted air pockets. Finish filling the hole with soil and firm it up around the tree. Apply a 3-inch layer of mulch spread evenly over the planting site to help the soil conserve moisture. Keep the mulch several inches away from the trunk so you do not open the area up to disease. Water the planting site immediately after planting thoroughly saturating the roots. Water daily for the first few weeks while the root system establishes itself, which can take several months. Thereafter, water several times weekly, especially if conditions are hot and dry. The trees are hardy and provided the preferred growing conditions do not need much attention besides proper pruning to survive and grow into healthy specimens. With their ability to grow in even the poorest soils that lack nutrients, fertilizing isn't necessary to produce abundant growth. Jacaranda has a high tolerance to drought conditions once established though regular water applications produce the best growth and production of blooms. However, during the establishment of roots in the planting site, newly planted trees require applications of water several times weekly or daily if outdoor conditions are hot and dry. Once the tree establishes itself into the landscape which takes approximately two to three months, watering several times weekly is sufficient. Pruning is the most important aspect of caring for the jacaranda tree, especially while it's young and developing its form. Do your pruning tasks after the tree has finished blooming in late summer so you don't lose blooms. If the tree has several main branches forming the trunk, select the hardiest branch and prune off the others at ground level. If additional branches form along the trunk area, keep them pruned off. Prune off any branches that are crossing or broken and any branches competing for space while the tree is young to create a stronger structure. To elevate the base of the canopy so you can walk under the tree, trim off branches forming along the trunk to a preferred height. Remove approximately one-quarter of the canopy to remove unnecessary branches and any large branches growing at the canopy's edge. Pruning while the branches are small prevents trimming off large branches, which opens the tree up to possible diseases. 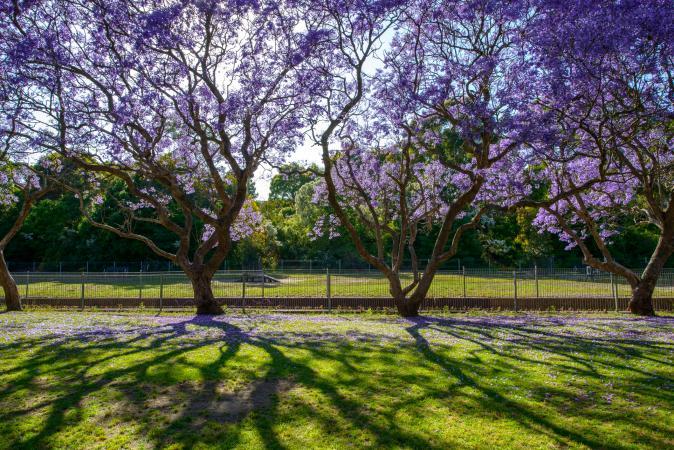 Pests are not a problem for jacaranda trees. Trees planted in conditions that are too wet can experience problems with disease. Mushroom rot is a problem when the roots grow in soggy conditions. Gardeners may first notice the problem by the foliage starting to lose its color and then a mushroom formation attaches itself to the base of the trunk. For established trees, there is no solution to the problem because the planting site is too wet and the tree can die. To avoid the problem of rot, always plant it in a site with well-drained soil. 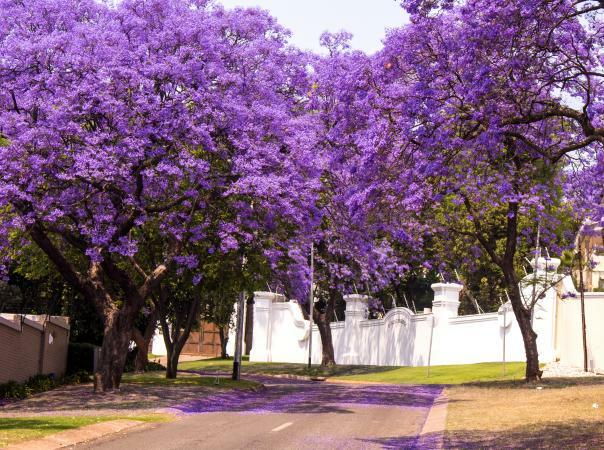 Purple is the color of royalty and the jacaranda tree's intensely colorful canopy of blooms is anything but common. You will be the envy of your neighbors when this tree busts into bloom and your landscape is sure to get the attention it deserves by this one majestic addition.